Pronounced “Wu Dong Mian” in Chinese, this stir-fried version of U-Don Noodle soup is awesome. 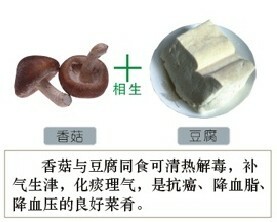 The vegetables can be substituted by any other vege that’s in the house. The dish is about 40% noodles, 15% meat, and 45% vegetables. I don’t really use measurements in cooking, so please don’t worry about being specific. 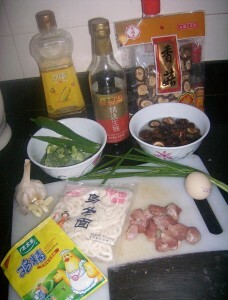 * Sesame Oil, Soy Sauce, Shitake Mushrooms (See the bag of dried 香菇, let them sit in water first), Chicken Broth (granulated is fine), a pinch of sugar, and bag of prepared Udon noodles (乌冬面, usually its a Japanese food); VEGES: Broccoli (cut up), Scallions (cut in 1 inch segments, not too short), garlic (1 or 2 cloves), green pepper (sliced), and an egg (for good measure). MEAT: Choose any meat you want, but don’t cut up a huge steak or anything… I sliced up some pork, as you can see. 1~ Boil U-Don noodles for a few minutes and set them aside.